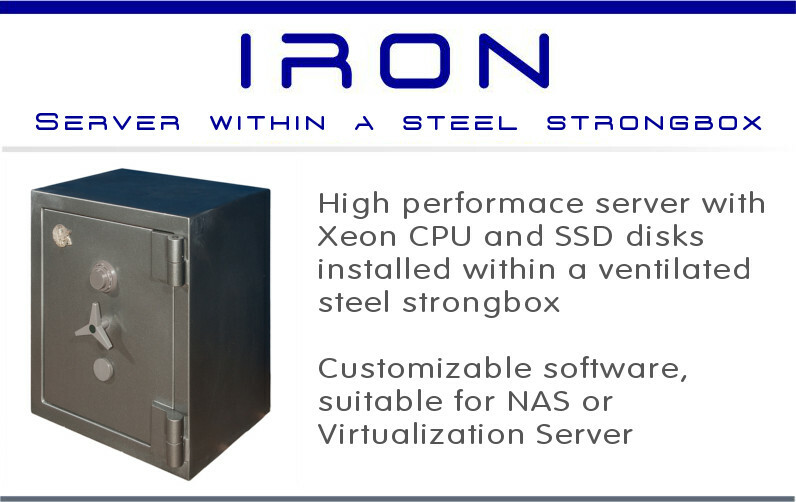 IRON responds to the needs of physical security of the server and its data. IRON is made with an armored strongbox tessellated to the wall and floor, or completely walled. The electronic parts are installed inside the strongbox with the use of a specially designed support to maximize the ventilation and keeping easy the maintenance of the hardware. The ventilation of the electronics is done with a special forced cooling system with low power consumption and low noise. The USB and VGA interfaces ports are installed on the internal side of the door, easily accessible for the maintenance of the operative system when the door is open. The electronic hardware is standard and consist of a Micro-ATX Motherboard, 2.5'' SSD and an ISO power supply, so the maintenance and update of the system is easy. To install IRON is necessary a small brickwork. Please, contact us for more in depth technical specifications, case analysis and commercial information. Copyright 2014 Develit S.r.L. All rights reserved.